At Miami Watersports Paradise our qualified, certified and experienced coaches will have you on your feet in no time, and their patient instruction ensures your fast progress to being ‘dope on a rope’. Intermediate rides at Miami Watersports Paradise benefit from the quality of our equipment, boat and coaching, progressing their riding skills and learning new tricks each and every session. Specific programs can be worked out to ensure your development is measurable, and the satisfaction of nailing your goals and landing your tricks lasts long after you’re back on the dock. With a tournament level boat and wonderful conditions, advanced and expert riders will adore the relaxed atmosphere we generate, allowing you to concentrate on enjoying what you do best. Wakeboarding is a highly rewarding sport that requires an average degree of athletic ability and Miami Watersports Paradise has lessons and sessions available for groups and individuals from 8-years old and upwards. 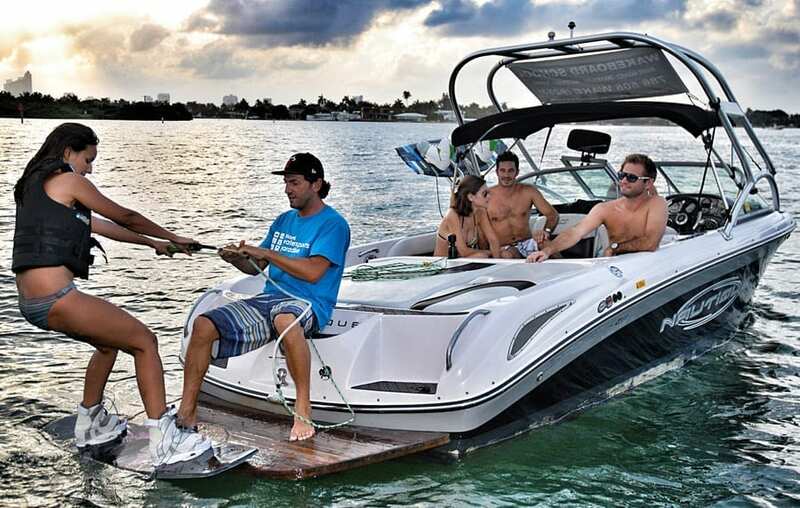 Call 786-484-8022 for more information about our Miami Wakeboarding Watersports Packages! The price is for the boat. On average, in a 1 hour session, 3 people will have time to wakeboard. If you wish to, you can also try Waterski, or Tubing during your session, at no extra cost. Just let your Captain know before you leave the dock. This is a private Wakeboard session. You can also do Waterski, or Tubing ( let your Captain know before you leave the dock).